Nothing is safe with kitty roaming the countertops: cups spilled, picture frames tossed off the ledge and snacks eaten. No matter what you do, you can’t seem to make Fluffy stay off those alluring counters. Despite stereotypes of crying kittens stuck in trees, cats are agile and competent climbers. In the wild, they used this skill to hide from prey, rest in warm places away from predators and survey their territory. In your home, cats are still attempting to do these things, and it’s your breakables that pay the price. Don’t scold or physically punish the cat. Your cat might get off the counter that one time, but she or he won’t learn to stay down – she or he will only learn be to frightened of you. Don’t shove your cat off the ledge. Your cat might fall and hurt itself. Don’t use loud or painful environmental punishers (like motion detectors that make loud noises). Your cat may become skittish and frightened in the entire room or house, not just that area. Instead, consider these steps to discourage your cats from being kings of the countertops. Step 1: Figure out why your cat is so drawn to those areas. Is he or she perching in the windowsill to watch birds? Snoozing on the warm fridge? Or just prowling around, looking for stuff to do and being destructive? All of these symptoms are your cat trying to talk to you about his or her environment. Before you can successfully dissuade your cat from hanging out on the counters and tables, you will need to fulfill his or her needs in other ways. Perhaps a cat tree or climbing shelves, access to other windows, or a pet bed in a warm place would be a welcome substitute. If your cat is knocking items off of shelves and tables, you may need to increase the mental stimulation of your home by providing new or different toys and games. Step 3: Make the countertops less alluring. 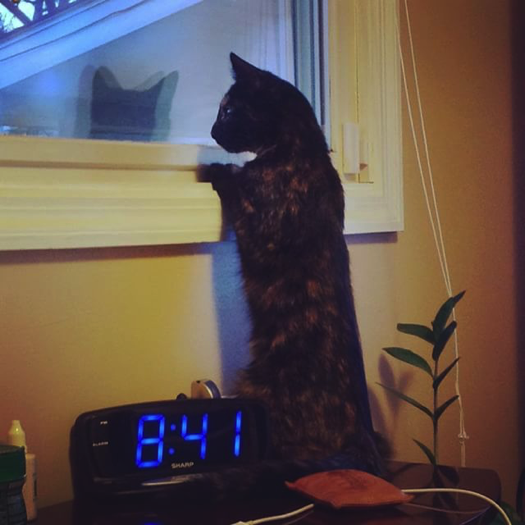 If your cat is drawn to the warmth and view of the window, close the blinds. If he or she likes to snack, make sure the counters are clean and there are no dishes in the sink. 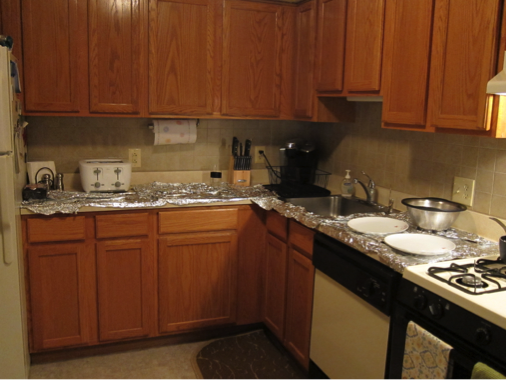 If your cat likes to prowl the countertops, cover them with aluminum foil to provide an unpleasant, but harmless, texture. Step 4: Provide playtime, every day. Your cat needs to exercise for at least 10 minutes twice per day. Playing together will increase your bond and provide stimulation so kitty won’t be so tempted by the interesting countertops. Try some tried-and-true kitty classics, like chasing a string or spraying toys with liquid catnip. Step 5: Choose your battles. Many cat owners choose to allow some countertop climbing. Cats are natural climbers and many cats like to be around their human families, drawn to high places in the room where their humans are hanging out. If your kitty simply can’t break his or her countertop habit, you may need to accept it as the price of admission for that cat’s love and companionship.